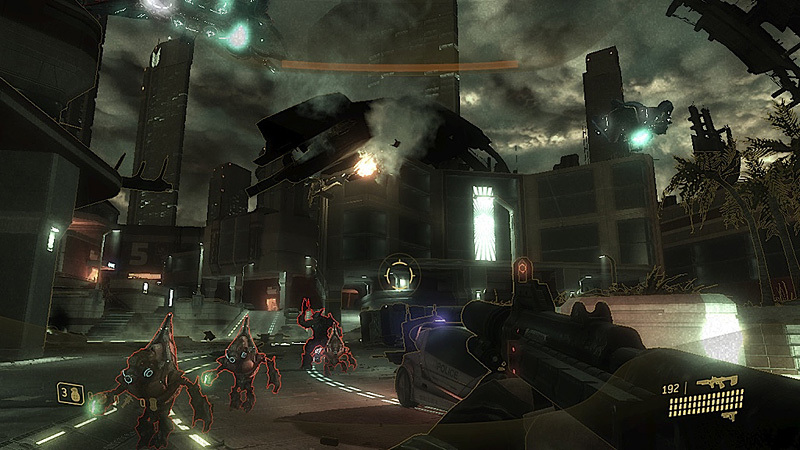 Halo 3: ODST, initially called Halo 3: Recon, was intended to be a PC style expansion pack for Halo 3. But during it’s development, the game evolved into a full-fledged package worthy of a standard retail game’s price tag. If you’re a fan of the Halo series and enjoy the fictional lore, Halo 3: ODST is a no-brainer. The common complaint, mostly among the community as opposed to game reviewing publications, is that the game is too short to be deemed a stand-alone title. My first play-through of the single player campaign was on Heroic difficulty, and I logged between 7 and 8 hours. This is actually typical for a Halo game, and I found ODST felt a good bit longer due to its some-what open nature. You play a voiceless character dubbed The Rookie, and the story takes place somewhere between the events of Halo 2 and 3. Somewhere out there is Master Chief, but there isn’t even so much as a mention of him. This is an entirely different branch of the Halo universe, and a story on its own. You, along with your squad (4 other ODSTs, plus a commander) have dropped into New Mombasa, a Covenant controlled city, to recon and find out what the Covenant are after, and report back to command. Of course, things go wrong right out of the gate and you find yourself alone on the streets. Unlike other Halo games, you are free to venture around the city at your own pace and in any given direction. The objective now, is to find out what happened to your squad and where they might be. You catch wind of objects scattered through-out the city, which invoke flashback sequences where you actually play as the other squad members when found. Each mission varies greatly. From the location, to the weapons at your disposal, and the main objective at hand. ODST’s campaign feels very diverse as you play-through, especially if you do multiple missions in a sitting. By the end, you’ve experienced many Halo-esque moments that will likely stay with you over the years. Not much has changed in the gameplay department. If you have played any of the other Halo games, you will feel immediately at home. That is, until you start taking fire. The big difference, being the way health is handled. Ironically, you have a limited rechargeable shield. Once depleted, you start taking real damage, which requires med kits to bring you back in the green. While this makes sense in the Halo universe, I still find it strange that Bungie decided to go this route. Most modern shooters have abandoned health packs in favour of automatic health regeneration. The first game I recall seeing this in, was the original Halo which debuted as a launch title on the Xbox platform back in 2001. I found the need to leave a combat situation to search for health packs tedious and annoying. If anything, it made the game feel dated, since this is the old way of doing things. The weapon load-out is almost identical to that of Halo 3. Back with a vengeance, is the trusty pistol which was absolutely lethal in Halo: Combat Evolved (the first game). There isn’t a better weapon suited for picking off Grunts and Jackals at close to medium range, with headshots being an instant kill. It is exceptionally fun using the pistol during the early waves of each round of Firefight, where there are Grunts-a-plenty. Sci-fi geeks will recognize many of the voices behind the cast of ODST. Mal (Nathan Fillion), Jayne (Adam Baldwin), and Wash (Alan Tudyk) from Firefly/Serenity are in the house. Along with the infamous Cylon known as Six (Tricia Helfer), from Battlestar Galactica. You might be wondering where Nolan North is at? After all, he is undoubtedly the most recognizable and commonly used voice in video games over the past couple of years. He’s here too, as one of the main ODSTs, Romeo. 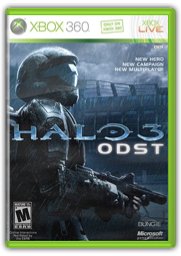 Halo 3: ODST brings a new multiplayer component to the table that is nothing but sheer fun! Firefight, is a 4 player co-op mode that pits you and your friends against increasingly difficult waves of enemies. Survival games are all the rage these days, and for good reason – they’re fun as hell! I’ve always preferred playing along-side friends and working together to thwart the enemy, as opposed to playing against them in typical deathmatch variants. 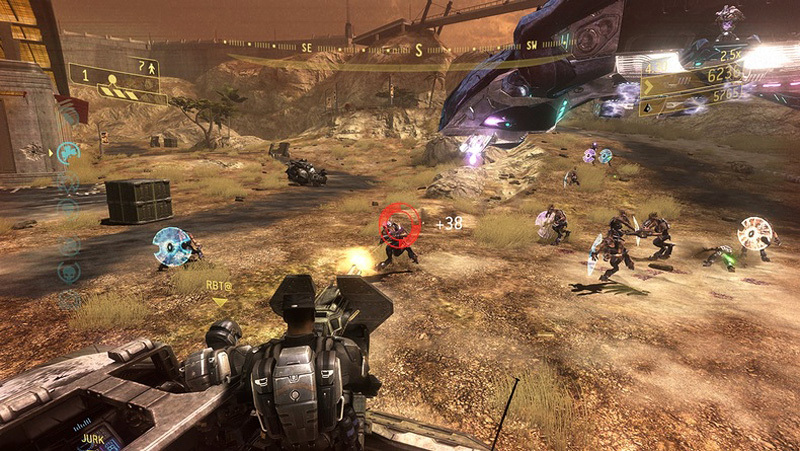 Firefight can also be played locally, and split-screen action can be enjoyed by 2 players online as well. Additionally, there is a second disc bundled with the game which includes a stand-alone version of Halo 3’s multiplayer component dubbed Halo 3: Mythic. It includes all of the maps from the Halo 3 disc, along with all of the DLC map packs. This is one hell of a bonus for those that don’t have Halo 3, or never bothered to pick up the map packs. Not so much for others, since there’s only really 3 new maps. So, once again, Halo 3: ODST won’t please everyone. And I’m sure there are people out there who will scowl at the very thought of playing it. But if you’ve enjoyed other games in the series, you will undoubtedly enjoy ODST. It has everything you’d expect from a Bungie made Halo game, and then some.